Certain regions in the Netherlands are sufficiently deficient in selenium to put newborn foals at risk of white muscle disease, researchers report. The disease is caused by a lack of the important trace element in the diet of horses. 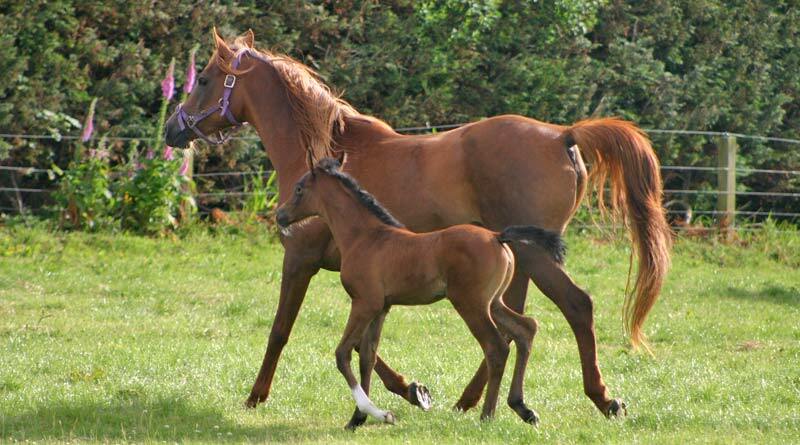 Common symptoms include muscle weakness, an inability to rise, lethargy, and an inadequate suckle reflex in foals. The muscle deterioration can also affect the heart. Testing is likely to reveal increased serum muscle enzymes, low to normal serum vitamin E levels, and low glutathione peroxidase, which is an enzyme that reduces oxidative damage. Post mortem examinations typically reveal muscle cell damage consistent with a nutritional cause. The mortality rate is typically 30% to 45%. In most soils, selenium is present in low concentrations, sometimes even below 0.2 mg/kg, a trend which is seen in many countries, the study team said. Apart from concentrations, soil conditions may result in poor bio-availability of selenium for plants, which can lead to deficiency problems in animals. Catherine Delesalle and her colleagues, writing in the journal BMC Veterinary Research, have described a series of cases of white muscle disease in foals in areas deficient in selenium in the Netherlands. Their work centered on eight newborns, all with the disease, living at four different premises. They also reported on the effectiveness of selenium and vitamin E supplementation in the affected foals, their mothers and other herd members. The case features and histories were mapped out for all foals. The selenium and vitamin E status were assessed for the foals, their mothers and herd members, initially and after three months of supplementation. Six of the foals survived. One was euthanized two days after hospital admission after becoming lethargic due to a complete absence of a suckling reflex. The owner opted for euthanasia. Another died four hours after admission. The six surviving foals showed normal vitamin E and glutathione peroxidase levels after supplementation. All horses tested at three of the properties similarly showed normal levels after supplementation. However, the mothers and other herd members at one of the premises showed no normalization. Horses from that property were diagnosed with ragworth poisoning a year before the study. The study team suspect that diminished liver function was responsible, although no disturbed blood liver enzymes were present anymore. Problems associated with selenium deficiency were expected to occur with increasing prevalence, they said. They said it was important that selenium fertilization received proper attention. In acidic and neutral soils, selenium availability is suppressed because it is mostly present as selenite, which may be fixed and highly insoluble as ferric selenite. Selenium can also form organic complexes that are generally not available to plants. Some of these organic complexes can leach from the soil. In very wet, chemical-reduced soils, like peat and clay, selenium is usually present in insoluble forms that are similarly unavailable. It was clear, they said, that many factors influenced selenium’s bioavailability, making proper management of selenium supplementation quite challenging. “Still, there are some tips that can help to support implementation of an effective selenium supplementation management. “In horses, focus needs to be directed towards selenium status of the dam, since the selenium status of the neonatal foal depends on placental passage and thus the dam’s selenium status during gestation. “The dam’s milk is low in selenium and is not considered as an important selenium source for the foal. “This emphasizes the importance of soil analysis for grazing meadows, for pastures with roughage production and for parcels intended for fodder crop production as well as the analysis of roughage being fed to broodmares. The maximum available levels in a large part of the Netherlands were too low for healthy selenium levels in crops, they said, adding that a similar trend was seen in Belgium. “The effect of selenium fertilization can be evaluated by follow-up analysis of the selenium content in the grass or roughage, since selenium can potentially be toxic in case of excessive supplementation, either through the crops or as a result of leaching to ground and surface waters (because the mobile selenate form is mostly used for supplementation). “In Finland and some other countries selenium fertilization proved effective in increasing the selenium levels in crops, animals and humans. “Possible interventions at soil management level mainly involve the choice of fertilizer. Some rock phosphate fertilizers are rich in selenium, and in most countries where selenium is permitted as a supplement to fertilizers, farmers can buy all kinds of fertilizers with added selenium. “Once selenium fertilization is applied, proper follow-up of the resulting selenium soil and crop content should be performed to check whether additional oral supplementation of livestock is necessary. “Oral supplementation can be achieved by applying top dressings on the feed, providing concentrates fortified with selenium or by providing the animals with selenium-enriched lick stones (although the latter approach entails that the uptake will greatly depend on the individual licking preference of the horse). They continued: “In order to prevent foals being born with white muscle disease in premises localized in areas with low selenium soil content, routine soil selenium content monitoring, together with analysis of the roughage fed to broodmares is recommended. “As the uptake of selenium by the crop is not only depending on the selenium content of the soil but is also influenced by the general soil fertility condition especially soil pH, phosphate and organic matter content, a complete soil fertility analysis of the top soil is recommended every four years. Special consideration needed to be taken in broodmares suspected of having a reduced liver function, as the selenium status may remain low despite oral supplementation, they said. The study team comprised Delesalle, Marco de Bruijn, Sanne Wilmink, Hilde Vandendriessche, Gerben Mol, and Berit Boshuizen.